I don't know about where you are, but here in Southern Quebec we are still having lots of snow & today it's very cold. I LOVE Winter, have even grown to love the snow & boy do we get a LOT of snow. We are right up in the Adstock mountains, ski country, so you can imagine....lot's of snow ! I just love how everything is White & gleaming, its a true Winter Wonder Land. 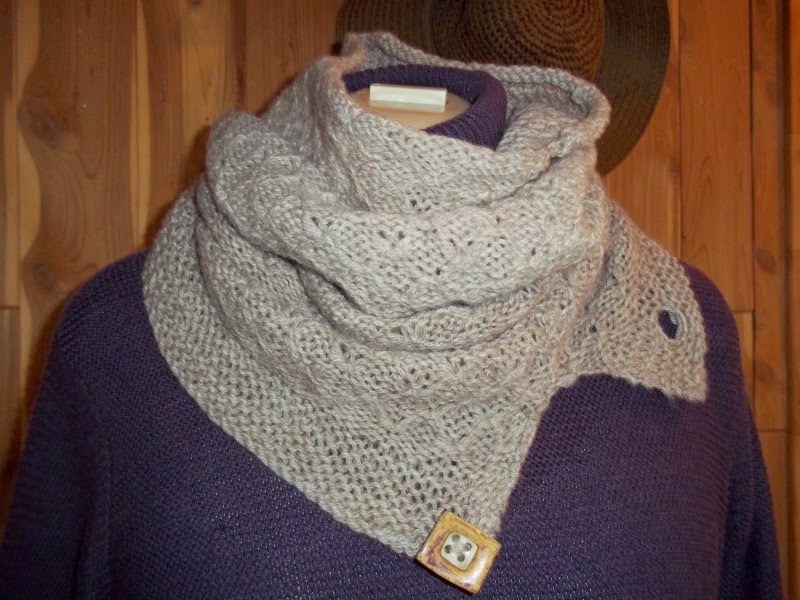 This is the perfect weather to wear a lovely Shetland Tundra smokering. I have one & I seldom take it off. It's light & Airy but has all the lovely wooly characteristics that you get only from pure sheep wool(well it does have 15% Qiviut too) so that helps with the softness & drape ! 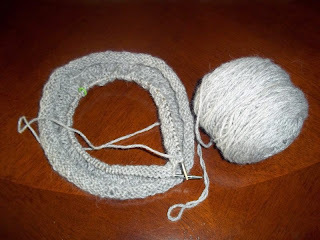 (Below) I now make these from our 3 ply light worsted weight. They are so much heavier, warmer & softer ! Ignore the button, the one I'm busy making has not button closure. It's just like a regular neck warmer that has enough length to cover your head & neck so you stay snug & warm ! The yarn looks lighter than it is in real life. The true colour is emsket. Grey with darker flecks in it. I will update with a picture once it's finished ! 1 thing you love about Winter & 1 thing you Hate about Winter ? Runs from March 19 th TO March 31st. One winner drawn at Random on 31st March. I live in Alberta and I too enjoy the winters. I have never heard of a neck warmer called smokerings. One think I like about winter is that I like the white clean snow and all the beautiful pictures that come of it. One thing I don't like about winter is the cold. I hope I am a winner, love your smokering. I live in Ontario. 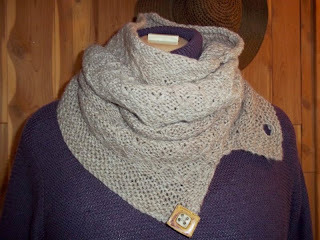 What I like about winter is that it is a definite seasonal change, a time to think about busier seasons and waiting for lambs and wearing wool sweaters and accessories. What I don't like about winter is frozen water buckets and frozen eggs!! Hello, congratulations, you are our winner ! I love the colder temperatures but not the mud (we live in the temperate, rainy Pacific NW). One thing I love about winter is the silhouettes of the bare trees against the sky. One thing I hate about winter is being stuck on my hill for days until the latest snow melts (the ice truck usually gets stuck trying to plow the hill so now they wait until it's almost thawed before they 'plow'). I love when it's snowing and the trees are covered with a white blanket, I don't like having to shovel it when there is so much to the point you can't find a place to push it anymore. What love about winter is seeing my daughters wear the different things I've knitted them through the years. What I hate most about winter is the cold. I love how cold winter is because I get to wear all my knitted accessories. I hate the cold but love being able to wear all my wool sweaters, handmade various types of mittens and my qiviut neck warmer. Love about winter in Canada... so quiet! Especially when snowing. Dislike is driving in the snow. I love playing with my kids in the snow. I hate driving on slick, icy, snowy streets. I love Christmas time and I hate having to wear lots of bulky clothing against the cold. I love the brisk air, long walks in the woods and the fire in my fireplace. I hate having less hours of daylight. I LOVE winter because of the fresh cold air, and I HATE winter because it has to leave. I live in Alaska and just got back from work on the North Slope where I got to see wild Musk Ox, so majestic. I love the quite sound of falling snow but not having to get up and go to work in it, just want to stay home and knit with Shetland wool. I love the crisp quiet mornings of winter, and the way the birch trees look in the snow! I also adore snuggling up under my down comforter in bed. I hate how dry and unhappy my skin gets, especially when I have to work outside all day. Winners from February giveaway !